27 year old Kat Larson is haunted by demons. Literally. And how was she to know that there was more than one type of demon? The Evils want to destroy her soul, while billionaire Sentinel demon, Zachary Winston, claims that he wants to protect her. Kat opts for Zach's protection…but it doesn't come without a price. It requires a demon bargain…and what he suggests surprises poor Kat almost as much as the fact that demons really do exist. Why would the handsome billionaire want to make such an agreement with an curvy, plain redheaded woman like her? Billionaire Zachary Winston has a mission and it's one that he vows to complete. As a Sentinel demon, his task is to protect Kat from the Evils that will corrupt her soul. His only problem is that she is his “radiant,” the one woman who can lighten the darkness of his demon existence and be his eternal mate. Zach has to fight an internal war between man and demon as he protects Kat, not quite sure which one will win. 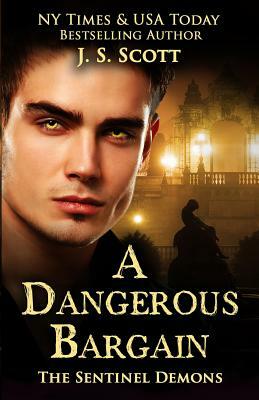 He's one part demon, one part man, but they both yearn for Kat's lush, full figured body and kind, compassionate heart. As Zach becomes more and more enchanted with Kat, he's hoping she can learn to love a lonely man/demon that's only slightly wicked.